Make the pastry. Sieve the flour and salt into a bowl. Add the butter and rub it in until the mixture looks like fine breadcrumbs. Add the cheese and rub in lightly. Add the egg, mix lightly then press the mix together to make a softish dough (you may need a little more water). Roll out and use to line a 22cm tart tin, at least 2cm deep, with a removable base. Leave the edges untrimmed. Prick the base with a fork, line with foil and fill with dry baking beans. Chill for 30 minutes. Preheat the oven to 200˚C, Gas Mark 6. Bake the pastry for 15 minutes, remove the foil and beans and bake for another 5 minutes to dry the surface. Reduce the oven to 180˚C, Gas Mark 4. Meanwhile, grate the yellow courgettes, sprinkle with salt and put in a colander to drain for 30 minutes. Rinse and press out as much liquid as you can. Halve the baby courgettes lengthways and drop into boiling water for 2 minutes, transfer to a sieve and pass under a cold tap for a second or two to arrest the cooking. Melt the butter in a frying pan over a medium heat. Add the onions. Fry for 3-4 minutes until soft but not brown. Add the grated courgettes. Cook, stirring, for 5-6 minutes to evaporate excess liquid. Leave to cool a little. Lightly beat the eggs with the cream. Season with nutmeg, salt and pepper. Stir in the grated courgettes. Tip into the pastry case. 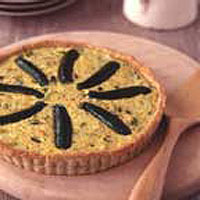 Arrange the halved courgettes on top. Bake for 30-35 minutes, until set but still slightly wobbly in the middle. Trim the pastry. Serve at room temperature. This recipe was first published in August 2003.